Tired of importing your autoresponder leads into your own autoresponder system? We now include an easy to use email broadcast system with all paid subscriptions. Our service is different... At SimplerLeads your leads are exclusive to your Gold level account or shared with only 2 other members with our Bronze & Silver Account levels. As a Gold member your leads are exclusive to your account only and will not be given to any other customer. The leads we provide are email delivery verified before being uploaded to your account and all leads are extremely fresh. With our upgraded plans we now offer a broadcast system that will allow you to quicky and easily send daily messages to your leads. Custom targeting categories are also available for our upgraded members. 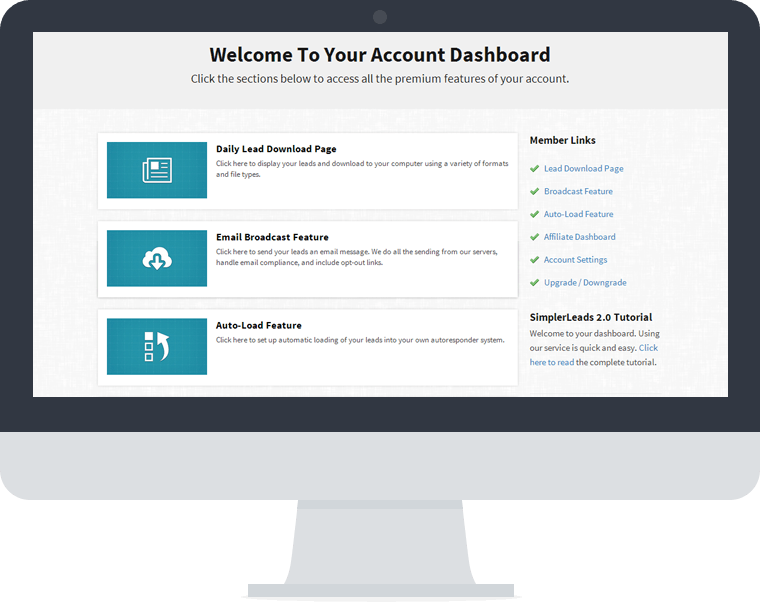 As a customer of SimplerLeads.com you will receive a username and password which will allow you to log in to your membership account. Each day your account will be automatically updated with a new batch of fresh responsive opt-in leads. In addition to uploading your own leads we also offer our upgraded customers an automated service called AutoLoad in which we upload your email leads into any autoresponder equipped with an import or upload feature.